An ancient evil is unleashed in the modern world— unless one fearless P.I. 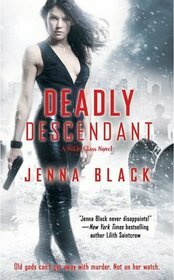 can hunt it down. . . . Nikki Glass, Immortal Huntress, returns in this new novel in the acclaimed series by Jenna Black.As a living descendant of Artemis the Huntress, private investigator Nikki Glass knows how to track someone down. But when an Oracle shows up, warning the Descendants about wild dog attacks in Washington, D.C., Nikki is afraid it might be a trap. The Olympians believe the “dogs” are really jackals, controlled by a blood-crazed descendant of the Egyptian death-god Anubis. Whatever. . . . If Nikki hopes to muzzle Dogboy, she’s got to catch him in the act. But when she stakes out a local cemetery, she ends up face-to-snout with a snarling pack of shadow-jackals whose bite is worse than their bark. These hellhounds are deadly—even for an immortal like Nikki. “Dog” spelled backward may be “god,” but that won’t stop Nikki from teaching these old gods some new tricks. Like playing dead. Jenna Black is a typical writer, which means she’s an “experience junkie.” She created the popular Morgan Kingsley urban fantasy series and The Guardians of the Night paranormal romance series. She lives in North Carolina. I am so looking forward to another page turner from Jenna Black! I loved the first in the series and can't wait for this one! Check out my WOW, on Lovey Dovey Books, when you get a chance! I will have to go back and check out the first book in this series if you are enjoying it so much. I hope you enjoy this WOW book once it releases!